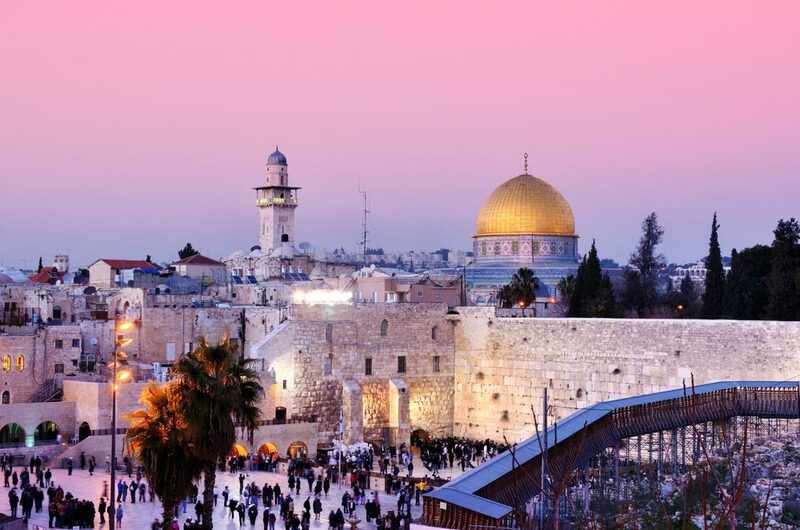 The Dome of the Rock is located in Jerusalem, Israel, and is the most famous Islamic site in the city and, arguably, its most recognized landmark as well. Unlike many other religious sites for Muslims, the Dome of the Rock is not a mosque, but a shrine that is built over a stone that Muslims believe was the place from where the Prophet Muhammad escalated to heaven. The Dome of the Rock is one of the oldest Islamic sites in the world. It is believed that the Dome of the Rock is built on the same location as the Jewish temples of Solomon and Herod, which are thought to have been destroyed by the Romans. After the Persian invasion in 614 AD, Umayyad Caliph Abd al-Malik ordered the construction of the Dome of the Rock between 689 AD and 691 AD. Jerusalem was captured in 1099 during the crusades and the Dome of the Rock was turned into a church. However, by 1187, when Jerusalem was captured by Saladin, the Dome of the Rock was consecrated as an Islamic shrine once again. Saladin’s nephew then carried out the renovations of the structure and repaired all the damages that the shrine had suffered. During the reign of Suleiman the Magnificent, the outer wall of the structure was covered with tiles, while the interior was decorated with marbles, mosaics, and faiences. The architecture of the Dome of the Rock is one of the most stunning aspects of it. The area immediately surrounding the sacred stone is circular and is topped by a wooden dome, which is about 20m in diameter. The inner circle is surrounded by an octagonal arcade with 8 piers and 16 columns, and the outer wall mirrors this shape. The outer wall and the dome are covered with windows. The Dome of the Rock is extensively decorated with mosaics, tiles, carpets, carved stones, and painted wood that adorn the interior as well as the exterior of the structure. The beautiful blue and gold tiles on the exterior were installed by Suleiman the Magnificent. The interior is filled with elaborate mosaics with detailed patterns and geometric shapes. The Well of the Souls is situated under the sacred rock and is accessible from a stairwell near the south entrance. The Dome of the Chain is also located adjacent to the Dome of the Rock and many historians believe that it was used as a model to the Dome of the Rock. 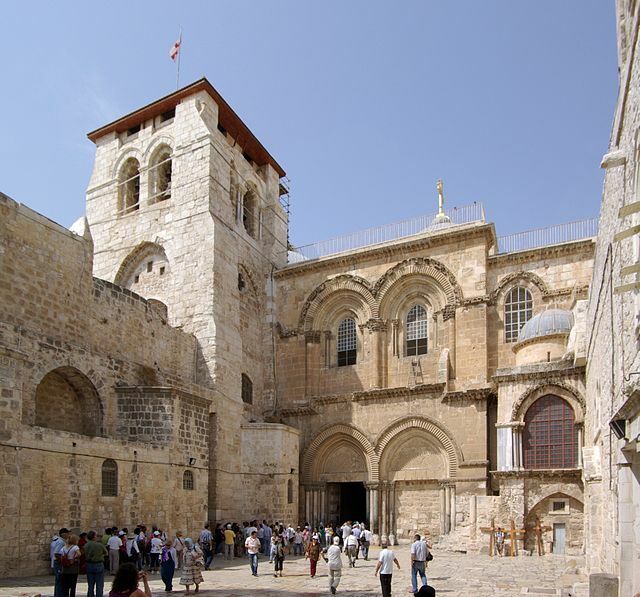 The Old City of Jerusalem has a number of accommodation options available for travelers. Budget hotels like Our Lady of Zion and Al-Arab Youth Hostel are popular options for backpackers, while mid-range accommodations like the Austrian Hospice and the Jerusalem Panorama are suitable for families, who are willing to spend a little bit more. The Old City does not offer many options when it comes to high-end accommodations; however, one can find such places outside the wall. The Grand Court Jerusalem Hotel and the Inbal Jerusalem Hotel are popular luxury hotels in Jerusalem. Jews believe that the location of the Dome of the Rock is where Abraham offered his son, Isaac, for sacrifice. The Dome of the Rock uses patterns and geometric shapes as it is believed that Allah cannot be represented in any figurative form. The color blue symbolizes the color of the sky and suggests infinity, while gold is used to represent the knowledge of God. Where is Dome of the Rock? The Dome of the Rock is located at Temple Mount in Jerusalem. The nearest international airport to Jerusalem is the Ben Gurion International Airport in Tel Aviv. The airport is about 52 km away from the airport and drive to this shrine will take around 43 minutes. The Jerusalem Malha Railway Station is located about 13 km away from the Dome of the Rock and driving to the location will take about 17 minutes. The road network in Israel is pretty good and traveling to Jerusalem from the nearby cities is quite easy. Buses are the most popular form of transport and the Central Bus Station is located close to the main entrance of Jerusalem. There are two main seasons in Israel: summer and winter. February and March are the months when the area sees rainfall and turns green as the windflowers burst into bloom. 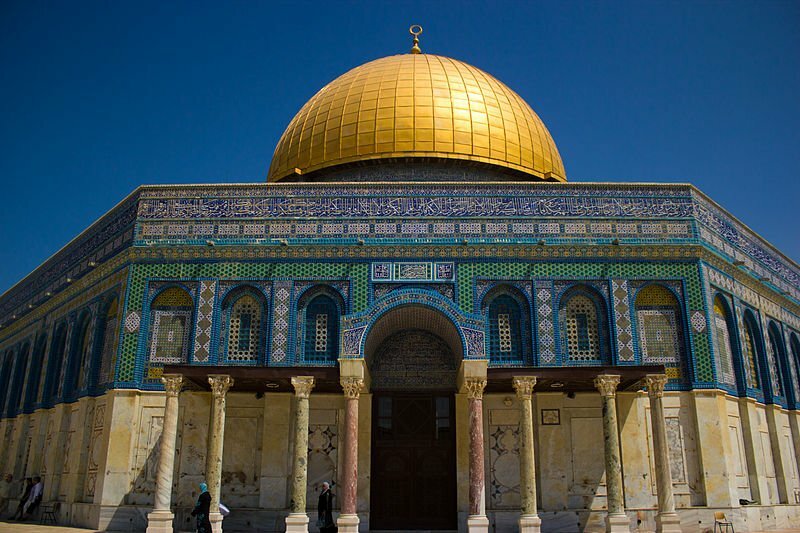 The Dome of the Rock is open from 8:30 a.m. to 3:00 p.m. It is important to note that only Muslims are allowed to visit the shrine. It is advisable for tourists, especially women, to cover themselves properly when visiting the Dome of the Rock. The Dome of the Rock is closed during midday prayers.